I know I have said it before but I do love a card when the papers do the talking and this is a fantastic example of that! Using a circle punch I made circles to create the muffin top, then roughly cut a cake case from contrasting paper. 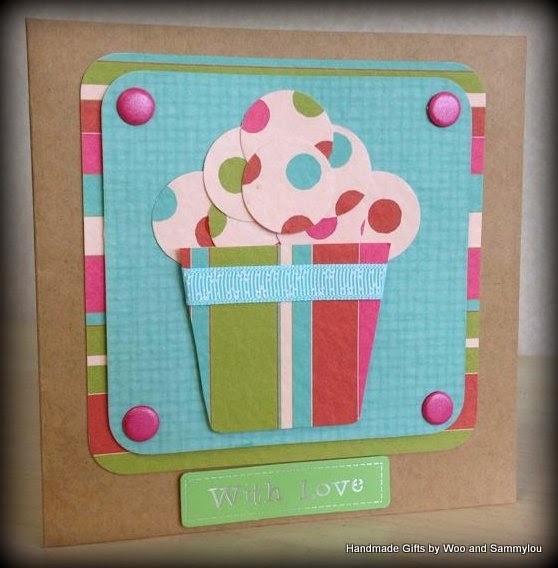 Add on a bit of ribbon, some card candy and a sentiment and this is the result. A quick, easy and effective card! Tis is such a great idea dearie.Loving the muffin. Well, my foray into the world of blogging begins! I am Sammylou, a HR Team Leader by day but avid crafter by night. I love to create things from paper and card, and this blog will be my chance to share with you what I do. I have a serious paper fetish and am always looking for ways to better my techniques and increase my crafting knowledge. I live with my husband, two children and two cats in Coventry.